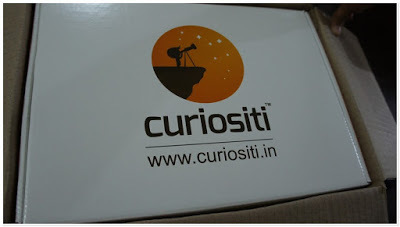 Curiositi- the world’s first syllabus-based activity box- promises to bring fun back to learning in innovative ways. In this post detailing my Curiositi Review, I go into the fun based Standosaurus Kit. When they reached out to me by e-mail, asking if I would be willing to review one of their activity boxes, I agreed, after checking their website to find that they design boxes based on the academic grade level of the child. Well, that seemed like fun, all right! Since Gy is in Grade 4, I requested for the box designed for that grade. They willingly complied and sent it by courier. Upon opening it, we realised that it contained 3 activities and Gy was keen to try out all three at once. But, toning down her enthusiasm, I suggested that we spread it out over three weekends, since that would also give us time to savour each activity and hey, give me time to review each one in detail as well! Curiositi also recommends the same thing, by the way. 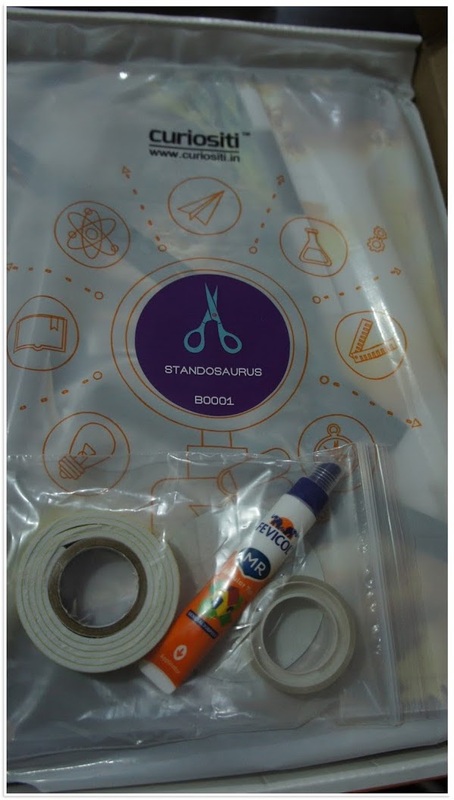 We decided to start with the Standosaurus, because, well, it’s got dinosaurs! And who doesn’t love those? So, as you can tell, it comes with a sealed kit and add-on accessories. It’s designed for kids and we mutually agreed that Gy would try doing the whole thing on her own and to her credit, she did about 95% of that. Within the hour, we had a lovely dinosaur pen stand ready to be displayed on Gy’s study table, complete with a space for her eraser and sharpener too. Liked this? Then you’d LOVE the DIY on How to make an igloo using a coconut shell! The neatness of the product. There was no wastage of material- always a plus. The fact that the child could do it on her own. For someone like me who is pretty artistically challenged, this was a bit of a boon! The dinosaur pop ups which added a nice touch to the stand. The factoid sheet at the bottom which Gy eagerly scanned while waiting for the glue to dry. The main stand had lovely fold-over flaps which made gluing easy. Similar ones could have been provided for the eraser/ sharpener stands. The spaces provided for gluing the stands down were not aligned with the cutouts; a tiny quibble, but something my daughter noticed pretty clearly. 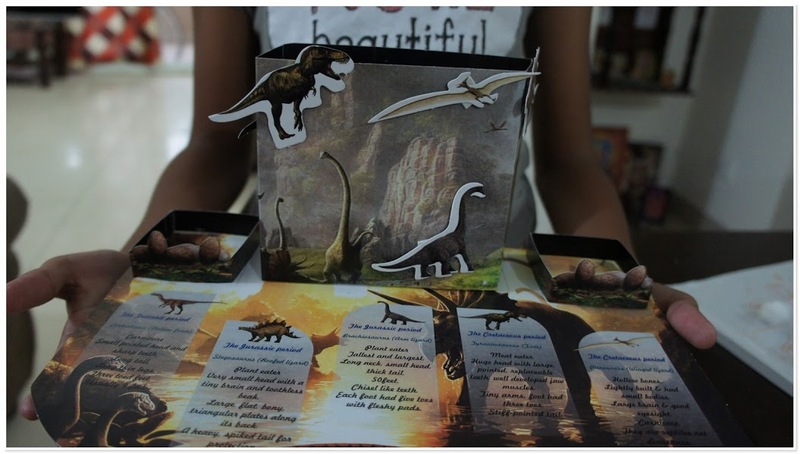 If you are looking for an activity box that is both educational and fun, then Curiositi is something your kids will enjoy! We are already looking forward to the next two activities- See Bacteria Grow and Communicating in Braille. Watch this space for those two reviews soon! For pricing, monthly plans and to know more about them, please visit them on their website, Facebook, Pinterest or Twitter. About Curiositi: (From their website) Curiositi offers the World’s First syllabus-mapped Activity Box, mailed to your doorstep every month. 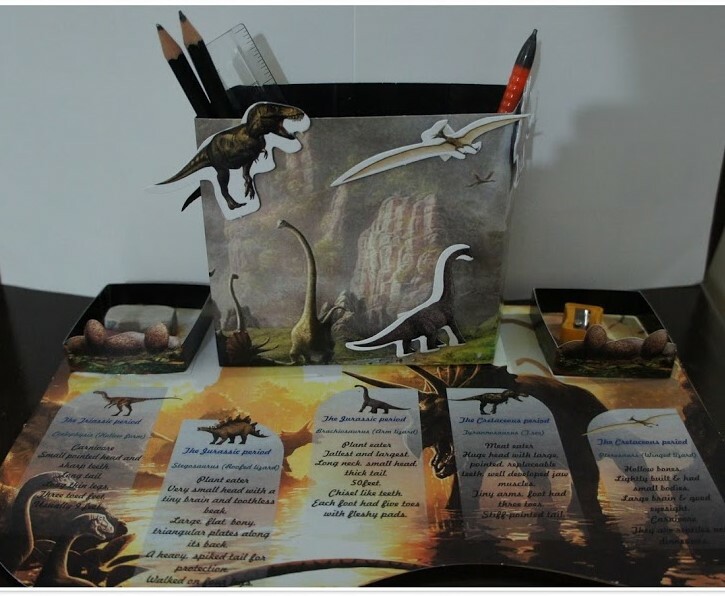 Each Box has exciting activities that integrate with topics your child is currently studying at school. Your children could become Germ Scientists and See Bacteria Grow or try their hand at Weaving and Fabric Dyeing. They will detect Fats and Carbohydrates in the food they eat or play a Board Game to learn the Periodic Table. Finally, Fun Meets Learning! I was sent an activity box and asked for an honest review. All views are my own. Such an innovative and fun activity! Gy must have had a blast! Loving the final product, would look great on her desk! A cool dino pencil stand. 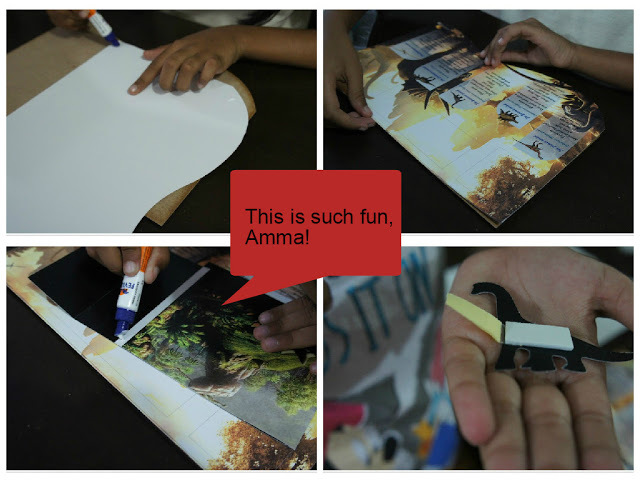 I like such DIYs for kids, as they are not only fun activities but also help the child to be self-sufficient. Yep. They have boxes from grade 1 onwards and I am sure he would love it! Looks like Gy and her Mommy had a good time together! Oooh dinosaurs! A must for H then. Off to look for the details. It's so self sufficient Tulika. Am sure he will enjoy it to the hilt! LOVE this post. I work with Preschool to age 7 and yes, you have to keep the energy up. I always feel like I'm in a performance! But it's so fun! You can also find college essay review Every point you made is just right: routine is a must and keeping it simple makes it a successful experience for them and the attention span! I have a rule of thumb…listening activities are no longer than one minute! Thanks for such great reminders for a successful class experience!